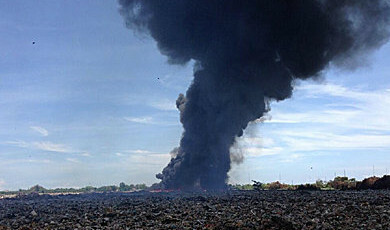 Another fire was set off at the Praeksa dump site of Samut Prakan province yesterday, attributed to people setting the landfill on fire to search for scrap metal. Firefighters were dispatched to the site in Muang district after a new blaze was reported in the early afternoon. Authorities were called at around 11.30am. Witnesses clearly indicated the fire was set by scavengers looking to unearth scrap metal from the heap. A total six fire trucks had to be deployed to control the flames. The landfill has been smouldering since a major blaze took place in March ignited by a heat buildup under the mounds of garbage. That fire sent poisonous smoke and pollution into the area and spread it over thousands of households that had to be evacuated. Several fires have taken place at the site since the incident both attributed to natural and man-influenced causes.